The Tiffen 58mm UV Protector Wide Angle Mount Filter is a general use, clear filter that helps to absorb ultraviolet light and reduce the bluish cast of daylight. This filter is especially useful when photographing at high altitudes or around bodies of water. No additional coloration or contrast is provided, allowing you to pair this filter with others. 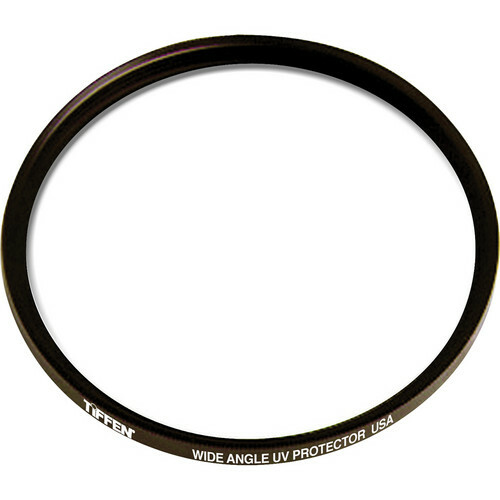 58mm UV Protector Wide Angle Mount Filter is rated 3.5 out of 5 by 10. Rated 3 out of 5 by CBRogers from Too Short for Lens cap This is a fine filter like you would expect from a maker like Tiffen. Be aware that the (Low Profile Design) of this filter will not allow you to put lens cap back on the camera. I suppose that this would be good for an extreme wide angle lens, but for regular use it does not work well. Rated 3 out of 5 by Mag from Too thin Functionally speaking, this filter is great. However, it's too thin; with the filter, there's no way a lens cap can be clipped on. Should this filter get damaged, I'd go with a thicker one next time. Rated 4 out of 5 by Richard from Lens Protector The design works as advertised - the filter does not block the field of view. HOWEVER, there are no front threads for a lens cap. Rated 3 out of 5 by jgegner from Very thin filter It is a great filter for its thickness. You will not be able to use a snap on lens cover. They readily fall off as there is very little rim for the catches to hold onto. Rated 5 out of 5 by chris_fanelli from Inexpensive & Essential Lens Protection I've found that Tiffen always makes a quality lens filter at an inexpensive price. It makes absolute sense to get a UV filter that is high quality and low cost, because you're protecting a huge investment, your lens. If ever your UV filter had to take one for the team and gets damaged, wouldn't you feel better that it wasn't a $100 filter??? Rated 4 out of 5 by SimonF from Nice filter but not for a lens cap This is a nicely made filter that has a very low profile. Most filters allow you to put the filter on the lens and then either screw a second filter onto the first (I don't know why you would want to do this but anyway) or to put the original lens cap on the assembly as if the filter was not there. This one does not have any threaded features to allow this. Therefore, if you want to put the lens cap on you are out of luck. At first, I thought this was a really lousy design, until I came to the conclusion that if you are using this filter as a protective device for the lens, why bother with the lens cap anyway? I put the filter on the lens, and have been using this setup without a lens cap for the last couple of weeks while on a vacation in London. It works great. I don't have to worry about the lens, or where the lens cap has disappeared to. With the cost of this filter almost on a par with the cost of the lens cap, this seems to make a lot of sense to me. Rated 3 out of 5 by Paul G. from A great design with a big flaw. This filter can with roughly ground edges where the glass meets the metal rim. The rim on this filter is very thin to avoid vignetting on ultrawide lenses --- a great design attribute if you don't mind the fact that no lens cap can get a grip on the thin rim. Rated 4 out of 5 by cmacd from good low profile utility filter this appers to be a good low profile lens protection filter to keep dust and scrachs away from the lens. it does have suficent threading on the front of the filter to retin a lens cap. Will this filter fit the Canon EF 28mm 2.8 Lens? Thanks! Yes, the Tiffen 58mm UV Protector Wide Angle Mount filter will fit the Canon EF 28mm f/2.8 lens.